Chamber members $15; general admission $30 and general admission for first-time attendees $15. 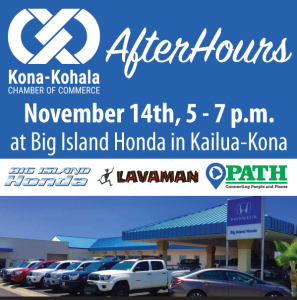 The public is invited to the Kona-Kohala Chamber of Commerce’s networking event, AfterHours, 5-7 p.m. Wednesday, Nov. 14 at Big Island Honda, located at 75-5608 Kuakini Hwy in Kailua-Kona. The event will be hosted by Big Island Honda, Lavaman Triathlons and PATH. This active living and transportation-themed pau hana will feature exciting updates from the three hosting companies and the chance to win door prizes. Enjoy a delicious taco bar pupu station and talk story with Chamber member businesses from all across West Hawai‘i. During the event, guests are invited to check out Honda’s unique Integrated Motor Assist hybrid cars at Big Island Honda. Lavaman Triathlons will share information about their upcoming winter break kids’ camps. Attendees will also learn about PATH’s new Vision Zero initiative to increase safe, healthy and equitable mobility for Hawai‘i County. The Chamber’s monthly AfterHours – which meets every third Wednesday of the month – is a networking event for attendees to build their professional networks by connecting to the West Hawai‘i business community.